Tamu Massif - Largest Volcano on Earth? So what's the largest volcano on Earth? 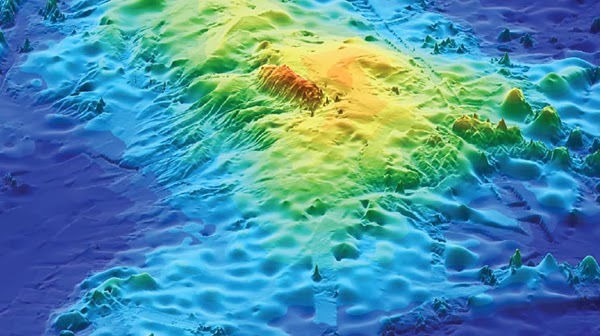 I used to tell students it was Mauna Loa, part of the Big Island of Hawaii but according to William Sager, a geophysicist from the Department of Earth and Atmospheric Sciences at the University of Houston, the largest volcano is actually Tamu Massif located on the floor of the western Pacific Ocean. 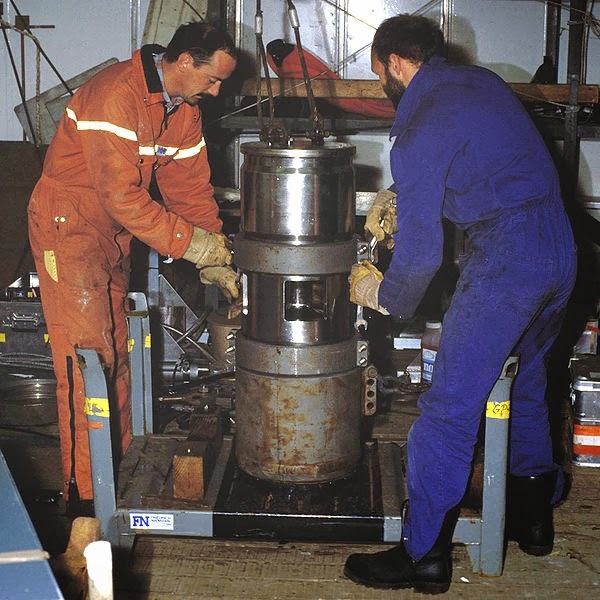 Sager, who's been studying this seafloor feature for the past 20 years, named it after Texas A&M University (TAMU) where he used to teach. The Tamu Massif is located on a seafloor feature called the Shatsky Rise which is found 1,600 km (990 mi) east of Japan. 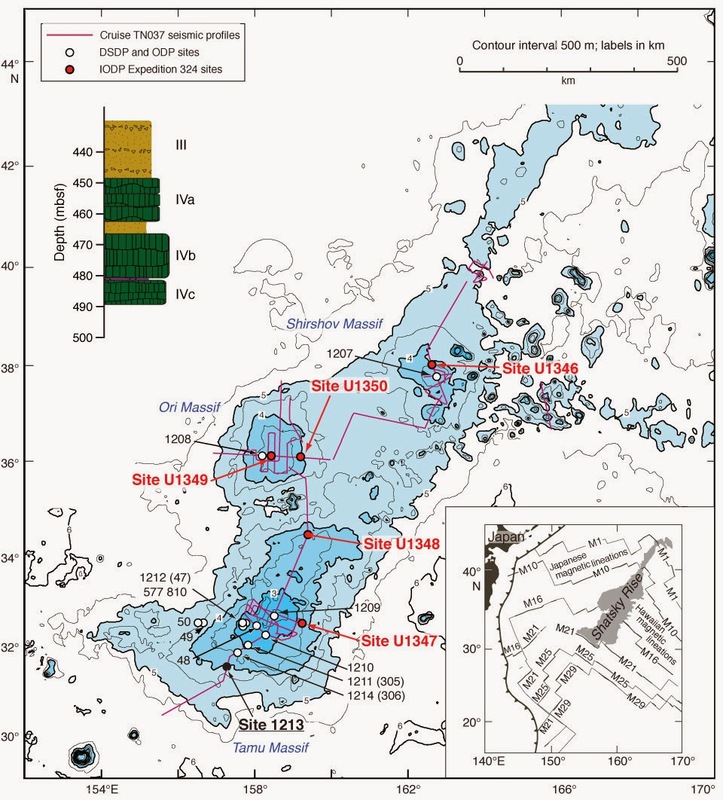 Other volcanic centers on the rise include the Ori Massif and Shirshov Massif as shown below. 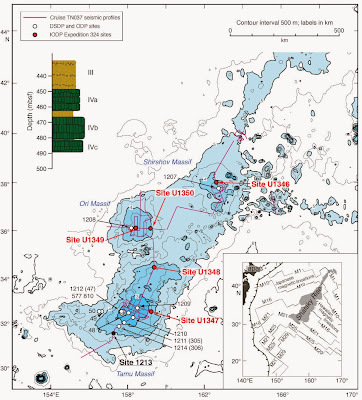 Seismic reflection surveys (red lines on map) and cores (red dots on map) of the seafloor taken by the Joint Oceanographic Institutions for Deep Earth Sampling (JOIDES) Resolution research vessel were used to study this seafloor feature. 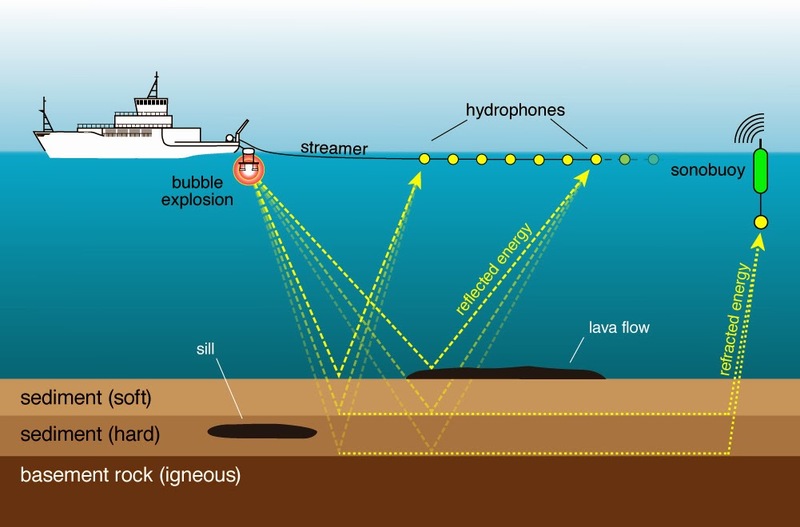 So what are seismic reflection surveys? 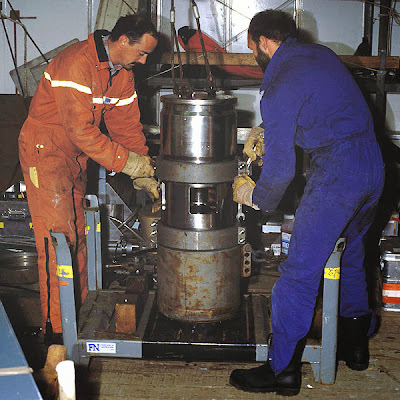 That's when a ship uses an instrument called an air gun to generate bursts of energy. An array of air guns can be towed behind the ship, under water, and then charged to about 18 MPa (2,600 psi) of air pressure. 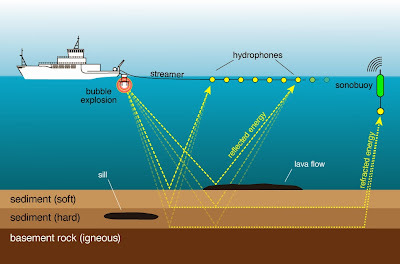 Suddenly released, this generates waves of acoustical energy which then travel down to the seafloor and then bounce back to the sea surface where they can be picked up by sensitive hydrophones. 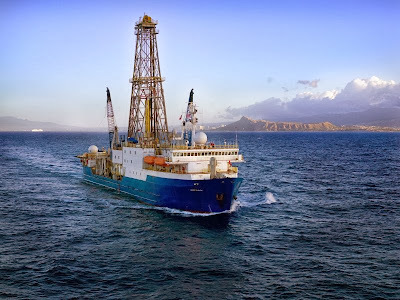 It differs a bit from regular sonar, which uses lower energy sound waves, since the waves of energy from the air gun don't just tell us the depth to the seafloor but, being higher energy, penetrate into the sediments and bedrock of the seafloor. Some of this energy simply reflects off the surface, but some travels down below the seafloor to reflect off the different internal layers of sediment and rock. 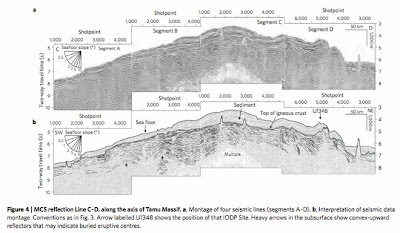 The timing and strengths of these reflections can then be interpreted to reveal some of the internal structure of the upper crust and provide what's called a seismic reflection profile. 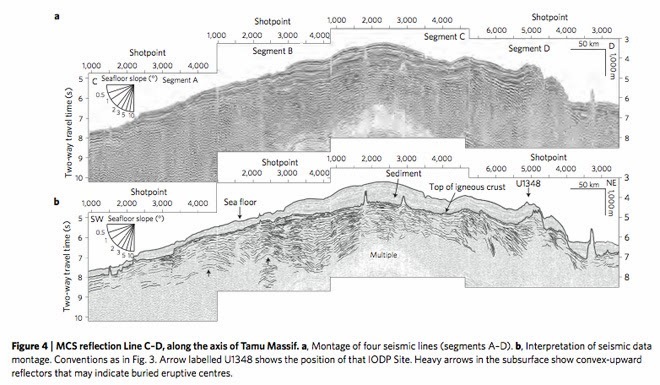 The seismic profiles for the Tamu Massif, along with geochemical studies of the basaltic lava flows sampled by deep-sea drilling cores, indicate that there seems to be a single eruptive center for the massif. 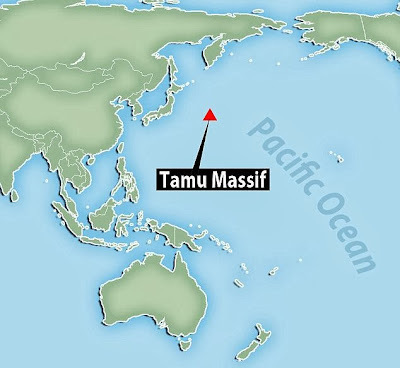 In other words, Tamu Massif represents a single large volcano, not several inter-grown volcanoes. That's why it was claimed to be the largest volcano on Earth by Sager and his team. Of course, there are different ways one could define "largest". The base of Tamu Massif apparently covers some 120,000 square miles or so, which makes its footprint on the seafloor about the same size as the state of New Mexico. 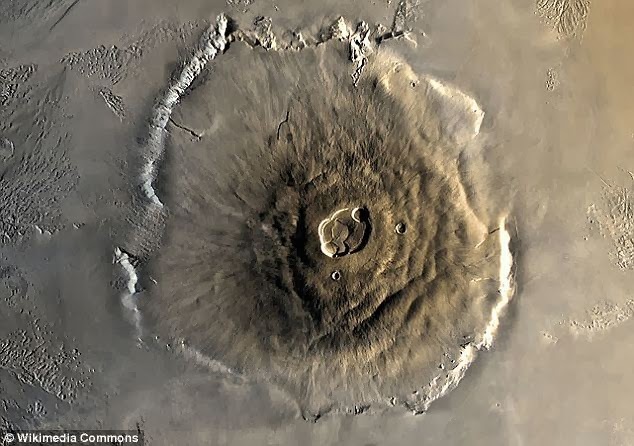 This may be slightly larger than the base of Olympus Mons, the largest volcano in the solar system located on the planet Mars (although Olympus Mons is much higher!). For comparison, the Hawaiian volcano of Mauna Loa has a base covering only about 2,000 square miles. While it is taller than Tamu Massif (Mauna Loa, after all, pokes almost 14,000 feet above sea level on the Big Island, after rising over 16,000 feet from the seafloor!). Keep in mind the diagram above has about 17x vertical exaggeration. The horizontal scale of 100 km is shown and you can see it covers much more distance than the vertical scale shown. 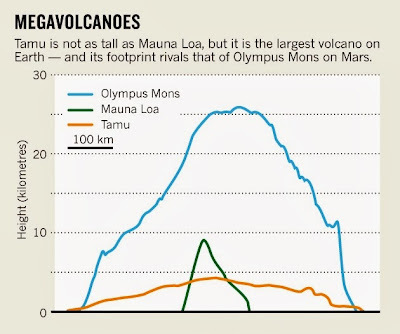 This effectively exaggerates the height differences of these volcanoes. 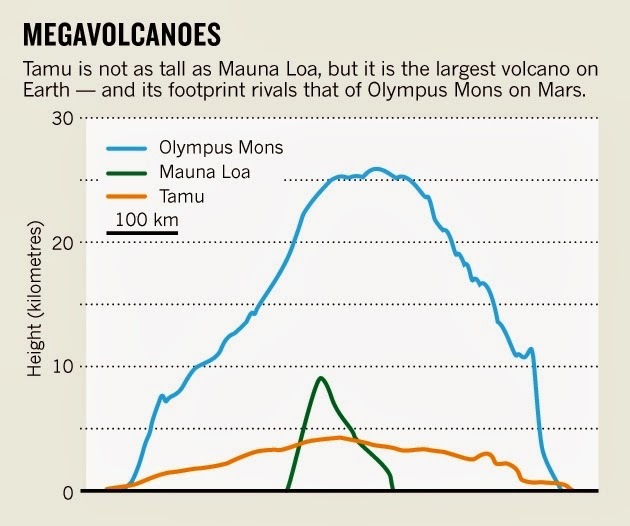 I would think the most important factor for determining the size of a volcano is the volume of erupted material, not the area of the base or the height of the volcano. 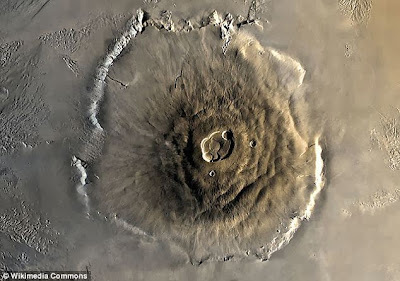 Using this, Tamu Massif is still the largest volcano on Earth but Olympus Mons still holds the record as the largest volcano in the solar system having about 25% more volume. Of course, Mauna Loa is much nicer to visit!